Bowie Knife Returns to Forteza January 9th! Following on our successful reboot of Modern Blade Concepts, we have gotten a lot of inquiries about if an when the studio would see a reappearance of training with that decidedly American weapons, the Bowie Knife and Tomahawk. We are pleased to announce that the wait is over — we will be kicking off the new year with a six week Basic Bowie course! 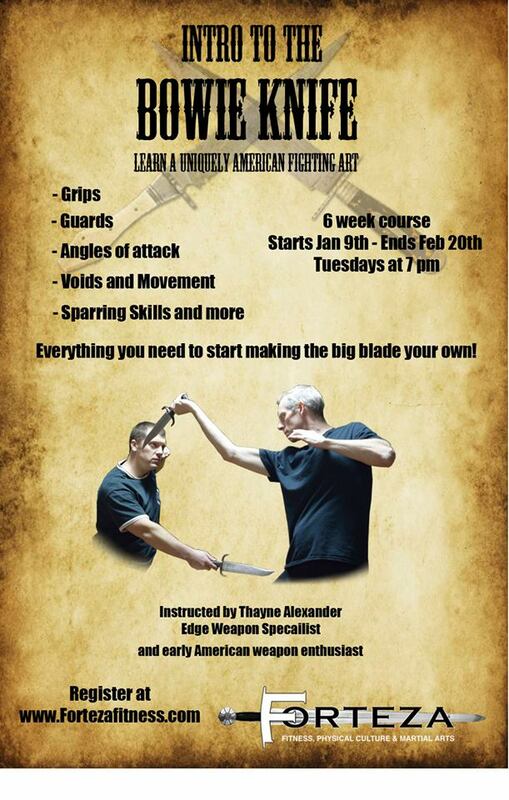 Starting January 9th, this course covers the basics of grip, angles of attack, including the “snap” and “back” cuts so particular to this knife, parries, body voids and sparring skills; everything you need to build a basic vocabulary with the weapon and start making it your own. Woven throughout the course are both historical and likely apocryphal stories of the knife and its use, showing how it became cemented in the American cultural consciousness. Basic Bowie is also the jump-start to the weapons portion of our Antagonistics program: a series of courses throughout the year covering knife, ‘hawk, single-stick and more. Take only the ones that interest you, or study them all, for that full American Fighting Heritage experience! Registration is open now, and includes a Cold Steel training Bowie. All you need is to show up on day one. Oh, and register now!